"The Simpsons" get turned into Legos in new episode "Brick Like Me"
The latest episode of Fox's "The Simpsons" was put together Lego brick by brick, in a CGI manner of speaking. Using computer-generated special effects, the town of Springfield and its residents have been reimagined in the style of the famed plastic toys for episode No. 550, "Brick Like Me," a play on the book title "Black Like Me." The episode combines CGI and the show's traditional animation to shake up Homer Simpson's world and teach him a lesson about parenting. Homer (voiced by Dan Castellaneta) has morphed from his familiar pudgy self into a real hard-body: a square-shaped, bullet-headed Lego man. He's still yellow, as are wife Marge (Julie Kavner), the kids and the rest of the town's inhabitants, but all easily and painlessly disassembled. With the box-office hit "The Lego Movie," a newly launched "Simpsons" Lego toy line and now the TV episode, it could be suspected that much corporate plotting was involved. People are probably looking at it going, 'All this fits and it's a plan.' No, it was just the love of Lego" and creativity, not cross-promotion, longtime "Simpsons" executive producer Al Jean said in a teleconference this week. "Yes, so all the cross-promotion was just gravy, delicious gravy," joked Matt Selman, an executive producer and co-writer, with Brian Kelley, of the Lego episode. Lego was consulted, he said, and a Fox spokeswoman said the toy maker paid for promotional consideration. 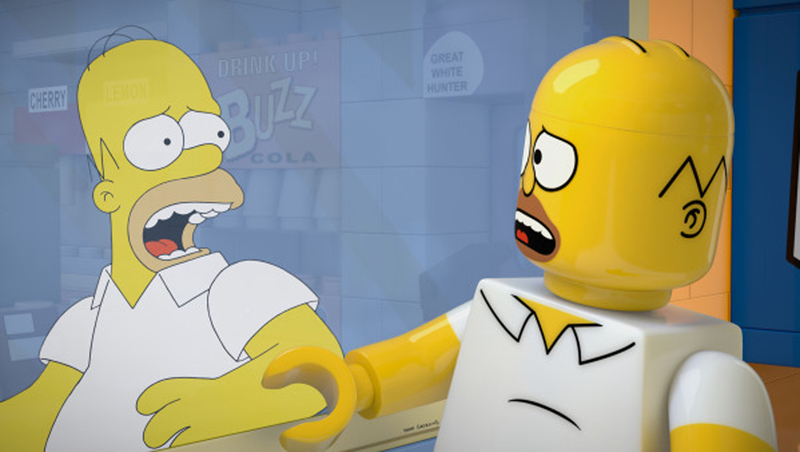 Unlike "The Lego Movie," which employed stop-action animation along with CGI, "The Simpsons" stayed away from three-dimensional figures that would have increased the difficulty of production, Selman said. Its smooth-faced CGI characters also vary from the sculpted ones that are part of Lego's "Simpsons" toy line. The "old-school" cylinder heads are classic Lego and were right for the show and the story, Selman said. It's an especially family friendly one, he said, since the toy connection is expected to draw a number of younger viewers and there was Lego's image to consider. "We had to tune down Homer and Marge's amour" in a scene between the characters' Lego incarnations, he said. A number of other familiar faces make appearances, including the Rev. Lovejoy (Harry Shearer), seen preaching the Lego version of the Bible's creation story. "Brick Like Me" will air Sunday, May 4 at 8 p.m. ET on Fox.